The Cardinals had a big inning, but the Dodgers rode multiple big innings and big dongs in their 17-4 victory. The win gives the Dodgers the opportunity to sweep a four-game series tomorrow and puts the Dodgers in possession of the second Wild Card spot in the NL. It also moves the Dodgers into a tie with the Rockies atop the NL West, with Colorado set to play later tonight. The Dodgers jumped on Cardinal starter John Gant early. Justin Turner lined a one-out single to center, and Manny Machado broke out his 35th dong of the season to give the Dodgers a 2-0 lead. 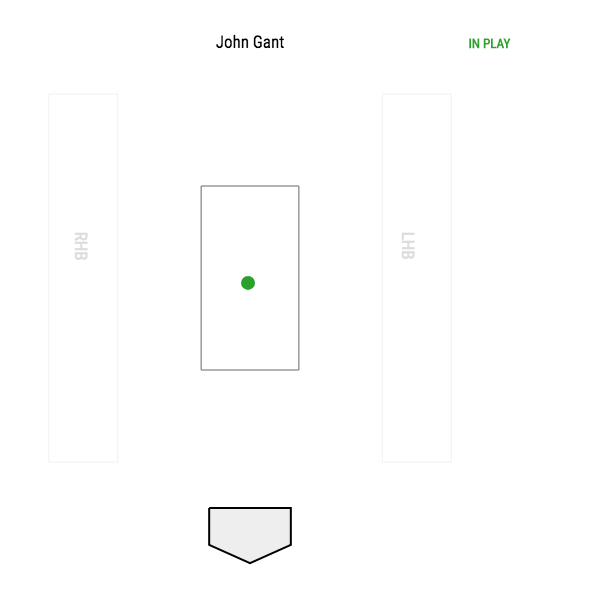 It was … not a great pitch by Gant. The Dodgers finally have a hitter that doesn’t whiff on middle-middle fastballs. Rich Hill was spotted two runs, and responded by striking out the side in the bottom of the first. The Dodgers went quietly in the second, and the Cardinals got a two-out baserunner on a swinging bunt by Patrick Wisdom. He may or may not have (but definitely did) go out of the baseline to avoid being tagged by Max Muncy, but it didn’t matter as Hill got a grounder back to the box to end the inning. The third inning was scary. Joc Pederson led off with a single, and Turner squared around to bunt (which would normally be the most alarming thing why even think about bunting with him). A Gant fastball ran inside and hit Turner in the wrist. Turner stayed in and both runners moved up on a wild pitch. In completely surprising Dodger fashion, a popup, intentional walk, strikeout and flyout stranded all the runners. Hill went 1-2-3 in the third, and more importantly Turner remained in the game on defense and caught a foul ball. Yasiel Puig led off the fourth inning with a first pitch homer, his 19th of the season and third in the last two games. Shouts to FOX for the camera angle that no one wanted. Hill struggled in the fourth. After a quick first out, he walked the bases loaded, including a string of nine straight balls. He found the zone again and got ahead 0-2, but Wisdom hit a hanger to Big Mac Land for a go-ahead grand slam. The Dodgers struck back in a big way in the fifth. It started with a leadoff single by Turner, who was apparently unaffected by the HBP. Gant followed that up with a pair of walks to load the bases before being removed from the game. Tyler Webb came in to face Cody Bellinger and allowed a two-run single to make it 5-4. Another pitching change brought Mike Mayers into the game, and he served up Puig’s 20th homer of the season to make it 8-4. Pederson and Turner led off the sixth with singles of Dominic Leone. Machado hit into a double play, but Pederson advanced to third on it and scored on a two-out single by Muncy. The Cardinals brought in another lefty, and he walked Grandal and gave up a single to Bellinger to make it 10-4. 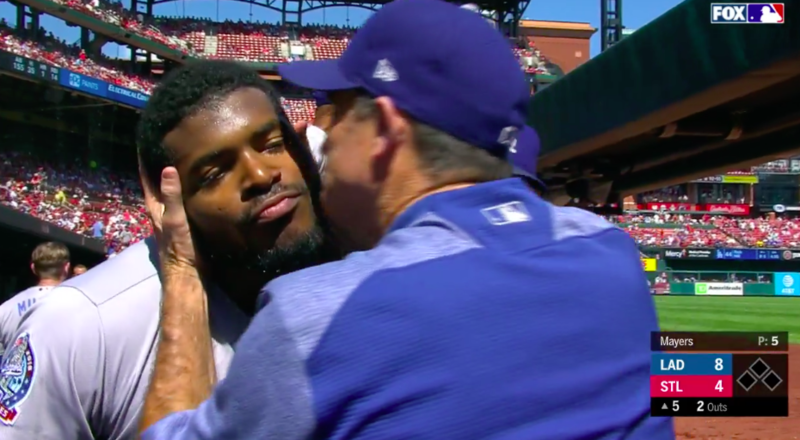 Puig broke out a third dong in the eighth inning, giving him five in the last two games. It’s his first career three-dong day, and his seven runs batted in is a new career-high for him. The Dodgers added on in the ninth. After a double and a walk, Andrew Toles grounded into what should have been a double play. Wisdom didn’t field the grounder cleanly at first and then tried to flip to Luke Weaver covering first, and the ball got away allowing Brian Dozier to score. Bellinger followed it with the Dodgers’ third three-run dong of the game, his 23rd of the season. That gave Puig a chance for his fourth homer, but he popped out to end the top of the inning. Hill was pulled after five innings, but the Dodger bullpen was mostly solid. Dylan Floro and Pedro Baez each allowed baserunners, but tossed scoreless innings in the sixth and seventh. Ryan Madson tossed a perfect eighth, and the ninth brought Julio Urias‘ first Major League action since May 20, 2017. His fastball sat 90-92 and topped out at 92.8 MPH, and he got two groundouts and a strikeout to end the game. The win moves the Dodgers to 82-67. Right now, the Dodgers hold the second wild card spot. If the Giants can beat the Rockies again tonight, the Dodgers will be back in first place in the NL West. We all have to root for Madison Bumgarner tonight. This is truly the bad place. The Dodgers can complete a four game sweep tomorrow. Ross Stripling gets the start for the Dodgers against Adam Wainwright. It’s an ESPN game, with first pitch scheduled for 5:00 PM.